This week saw a change towards much more unsettled conditions, due to the retreat of prevailing high pressure conditions, allowing low pressure systems to push in from the north atlantic (see synoptic chart above). There were showers in London and much of the UK throughout the week between partly cloudy skies, with only southern coastal areas of England remaining relatively sunny. Both Monday the 30th and Tuesday the 31st saw some overcast and rainy conditions in London. It became somewhat drier overnight on Tuesday, but the cloud and occasional rain continued on Wednesday, with temperatures in Greeater London dropping to around 13 degrees C.
Wednesday the 1st of August started out with bright and Sunny spells across much of the UK, including in London, but there was further clouding over and some heavy showers as a cold frontal system pushed in towards England from the west. Winds were quite breezey but during the sunny periods temperatures peaked to a warm 24 degrees C. This was followed by a largely dry night in London with only some showers reaching into western England. Friday the 3rd had similar conditions – bright sunny spells in the morning followed by some intermittent heavy showers in the afternoon. This eventually peetered out to a dry night with temperatures dropping to 13 once again. Throughout the working week winds were light to breezey, predominantly from the southewest across London. Some heavy rain showers were observed in London during the mornings of Saturday the 4th and Sunday the 5th, with winds from the SSW up to 20 kmph. This later cleared to dry but overcast conditions towards evening, with temperatures peaking at 20 and 22 degrees C on Saturday and Sunday respectively. Given the unsettled conditions compared to the high pollution events forecast and observed during the hotter weather in the previous week, it was perhaps not surprising to see that the Met Office forecast uniformly low air quality pollution index levels this week, with no particular peaks being forecast, but we should wait and see what the chemistry observations were. Showers, which were common this past week, can be a particular limitation on dispersion of pollution, since they promote deposition of particulate matter and inhibit convective mixing through the boundary layer. The forecast for the upoming week is looking even drearier. The skies will be largely overcast with rain showers building up to heavy rain on the Thursday, with further showers predicted through the weekend. Temperatures will be cooler too, likely not pushing past 17 degrees C after today. Winds are going to remain light and predominantly from the Southwest. I’ll be taking a closer look at some of the lidar observations from the first week of the IOP (when a potential case study was identified) in an upcoming blog post in the next few days, so watch this space for further updates. Temperatures have stayed low this past week, with an intense ridge of high pressure remaining of eastern Europe. On Monday the 6th there were widespread patches of snow on the ground, which were conducive to the formation of extensive fog across England. The west of the UK was a little warmer than the east thanks to the presence of a frontal system which brought heavier cloud. On this day London saw widepsread mist and low cloud, and outbreaks of wintry showers had left the urban surfaces icy in places with maximum temperatures around 3C. Monday night was also dry in London with further mist and fog, though some clear spells also crept in and temperatures dropped to -3C. The Met Office UKV model outputs were predicting shallow boundary layers across the majority of the IOP sites on Tuesday the 7th – between 200 and 800m through the morning, and the sensibe heat fluxes were predicted to peak around 100-120W/m2 that afternoon, likely due to the clearing conditions that had been forecast. The high pressure ridge over Europe was still inhibiting the progress of Atlantic weather systems across the country, and it was in the morning that the wintry weather started to die down around North London, leaving only heavy cloud cover. Temperatures droped to bitterly cold that night, around -7C to -8C, leaving a harsh frost as well. Temperatures were remaining low on Wednesday the 8th as well, with many places in the UK remaining only at or below freezing during the day and dropping to -4 in the evening with only light winds. As such the turbulence and surface radiation measurements from the BT tower were relatively steady throughout the day with only some variation. London was still clear and cold with temperatures fluctuating between -1C and 1C under partly cloudy skies for much of Thursday the 9th. At 7pm there were snow flurries observed in the capital that lead to some light accumulations. The conditions for the snowfall can be seen in the figure of the Met Office’s synoptic forecast below, where a very slow-moving warm front is progressing southeastwards. Meanwhile London was experiencing cold and icy but otherwise dry conditions with very little wind. This will likely have lead to another shallow, stable boundary layer with the potential for accumulating moderate-level concentrations of pollutants in the urban area. These cold and dry conditions remained in place across London into the 11th, where the maximum temperatures again barely rose above 1C. The winds remained quite light – even 190m up at the BT tower the observed winds only peaked at slighly above 14kmph, while at the surface they were variable at between 5 and 8 kmph. Sunday the 12th saw the formation of mist and fog in London during the morning, with the visibility styaing hazy into the afternoon with some light rain being observed at 11.50. The observed relative humidity at the BT tower was in the 90%’s, with a negative sensible heat and a positive latent heat flux from the early morning to early afternoon, reflecting the misty conditions. Then temperatures began to rise under the cloudier conditions, to 3-4C. Although temperatures are now on the rise as of today, strengthening winds are still making it feel quite cool in London. On Tuesday the 31st some mist and fog was observed prior to 6am in London eventually giving way to some slightly wintry showers and scattered cloud. With cold winds being variable from the Northeast the temperatures did not get much above 2C. 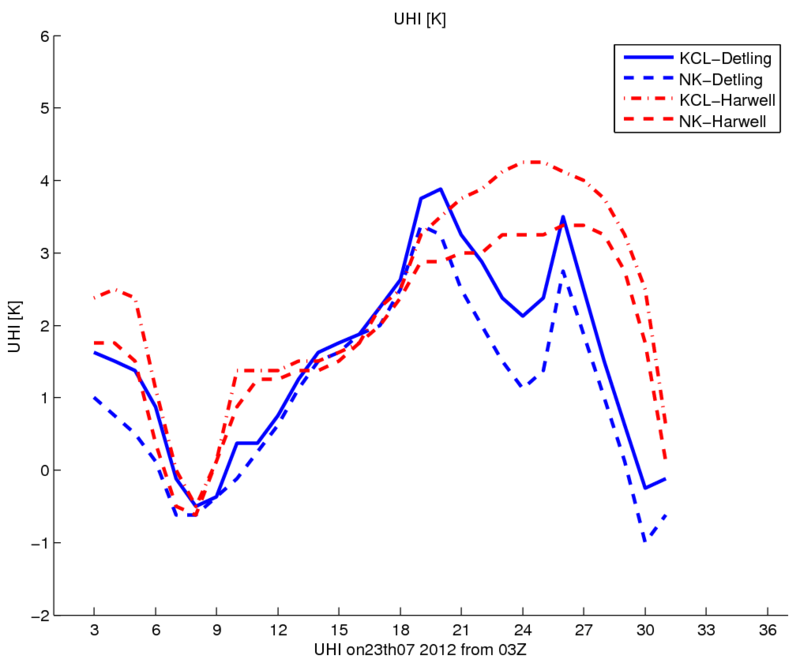 It continued to be cloudy on the Wednesday with temperatures peaking around 3C, and the Met Office’s UM UKV model output for this day was predicting boundary layer heights between 800 and 1200m for most of the IOP sites (deepest at KCL), apart from Dettling where it was predicted to be between 400 and 600m. The signatures of the cold weather can be seen in the radiative measurements from the BT tower, where the sensible heat remained well below 100W/m2 for most of the week and raely grew to more than 200W/m2. By the Thursday the 2nd, high pressure was still the dominant feature affecting the UK (see figure below), bringing cold Easterlies to most places, however because of this the day was dry and clear with only occasional snow flurries at highr ground in England. London was cold and dry with frost forming in most areas. The mamum temperatures barely reached 2C and dropped to -5C in less urbanised areas on Thursday night, leading to further frost. At this point the Met Office labelled the past few days as “the coldest spell of winter thus far”. 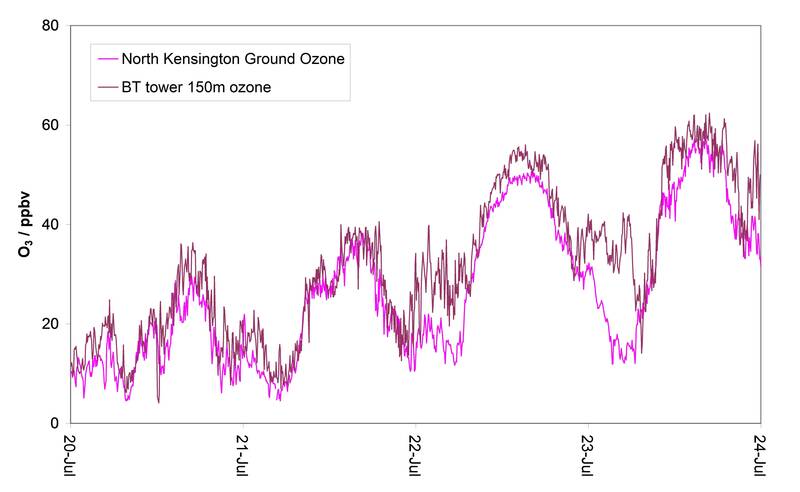 Interestingly, the Met Office’s UKV output was predicting quite deep boundary layer depths of around 4000m at bht Chilbolton and the KCL sites on the Friday, while the day in London was similarly dry, cold and clear as before. But by this point the possibility of more widespread snowfall was starting to crop up in the news, with more “disruption” and “big freezes being anticipated. Saturday began in London with the weather being partly cloudy and the mercury reading about -2C, hovering around -1C for most of the day. The weather was mostly dull and partly cloudy until, at last, around 7pm some light snowfall began, which continued on and off through the night until 5am on Sunday, leaving between 3 or 5 inches lying across much of the city. Throughout yesterday on Sunday the 5th of February, fog patches were frequently observed across London due to the surface cooling effect of the snow. We kicked off the past week under a flat ridge of high pressure over most of the UK, which brought dry and sunny spells to London on Monday the 23rd. There was a light breeze with the temperature remaining around average for this time of year, maxing out at 9C and dropping to -1C at night, bringing a widespread frost to much of the southeast. The BT tower station recorded calm conditions with very little variation during this time. An interesting feature was that in the early hours of the morning on the 24th, the Met Office UKV output was forecasting a boundary layer depth well below 500m for all of the IOP sites, likely due to the cold, frosty temperatures. This could potentially have kept a greater concentration of overnight pollutants at the surface. But by the 24th and 25th, precipitation a cloudier weather began to spread eastwards and two warm fronts advanced across the UK from Ireland. This brought milder overnight temperatures of around 6C and occasional light rain and drizzle. On these days the BT tower recorded morning rush hour CO2 peaks between 8 and 10 as would be expected, but also of note on the 24th was an increase in sensible heat and turbulent kinetic energy from the surface between 2pm and 6pm, perhaps caused by a clearing of cloud cover increasing the shortwave radiation reaching the urban surface. These milder warm-sector conditions persisted into the early morning of Thursday the 26th, when a passing cold front then brought some locally heavy showers to England but London itself remained relatively fair with only some cloud and maximum temperatures of around 8C. The 27th saw a complex region of low pressure with numerous organised showers to the North of the UK, but London remained quite dry with only some showers developing in the afternoon, and mistier conditions overnight. Another noteworthy event was the early fog observed in London on the 29th until sunrise, when it cleared, but the Sunday remained cold at around 4C, with a brief shower observed at 5pm. As we began the last week much of Europe was still under the influence of a high pressure system centred over Germany. Monday the 16th had a clear night in London with only some patchy cloud and a chilly Easterly breeze, with the urban temperature dropping down to 1C in some areas. Approaching Wednesday and Thursday the high system had migrated to the south of the UK (see attatched Met Office chart) and there was a heavily fronted low-pressure system to the North. A cold front situated over the south of England brought cloud and some rain to the London area, with the urban temperatures measuring a maximum of 12C and dipping to 5C. By Friday London was experiencing some early clear skies, but mostly cloud and drizzle and a westerly breeze brought in by a warm front advancing over the most of the UK. The past weekend has been partly cloudy but mostly mild with highs of 12C. An interesting event that might be of note was on Thursday the 19th. Perhaps caused by a peak in the rush hour traffic,the concentration of CO2 being measured at the BT tower rapidly climbed to over 35 mmo/m3) between 8am and 10am. This temporally correlates with two rapid peaks in the sensible heat flux and a peak in the turbulent kinetic energy, but does not seems to be reflected in the CO2 flux itself. (The plots can be accessed on the ACTUAL website). The following moderate air pollution episode was observed in London over the past weekend. Hopefully the ClearfLo IOP will produce some interesting data. Settled, cold weather on Saturday 14th January led to a buildup of local traffic pollution. Widespread ‘moderate’ nitrogen dioxide and PM10 and PM2.5 particulate was measured close to busy roads throughout London in both central and suburban areas. The greatest PM10 concentrations were measured alongside the North Circular in Brent and the greatest nitrogen dioxide was measured in Knightsbridge. ‘Moderate’ PM10 particles were also measured in residential west London at the National Physical Laboratory in Teddington. Further west, ‘moderate’ PM10 and PM2.5 particles were measured in Reading. ‘Moderate’ PM10 was also measured in Sussex alongside the A259 east of Bexhill-on-Sea and alongside the A2011 in Crawley. North of London, ‘moderate’ PM10 was measured alongside the A1 in Bedfordshire. Outside the south east, ‘moderate’ PM10 and PM2.5 particles were measured in many cities in the eastern half of England.